Velcro® brand VELCOIN® woven hook and loop coins consist of minute flexible hooks or mushrooms, which engage with a mating woven, knitted or nonwoven loop tape comprised of small soft loops or yarns and are available with a variety of adhesives to best fit your application. 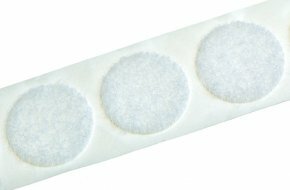 These HOOK 88 and LOOP 1000 products have a pressure sensitive rubber-based adhesive backing and are recommended for most substrates. It is high tack, quick setting and reaches 90% of bond strength in an hour of application (before using an adhesive for production, it should be tested to determine the suitability of the product for its intended use). 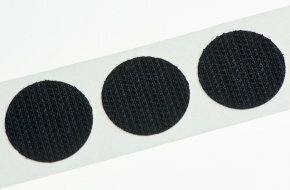 VELCRO® Brand VELCOIN® - 22mm diameter peel and stick 'coins' of black HOOK 88, designed to match LOOP 1000 VELCRO® Brand products. Supplied on 25m reels carrying approximately 1,200 coins. VELCRO® Brand VELCOIN® - 22mm diameter peel and stick 'coins' of black LOOP 1000, designed to match HOOK 88 VELCRO® Brand products. 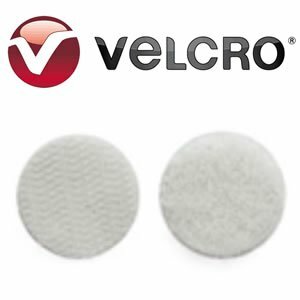 VELCRO® Brand VELCOIN® - 22mm diameter peel and stick 'coins' of white HOOK 88, designed to match LOOP 1000 VELCRO® Brand products. VELCRO® Brand VELCOIN® - 22mm diameter peel and stick 'coins' of white LOOP 1000, designed to match HOOK 88 VELCRO® Brand products.